Activities to help you position, carry, hold & play with your baby from Orthomerica and Children's Healthcare of Atlanta. Available in English, Spanish, French, Portuguese, Japanese, German, and Swedish. A list of diagrams that depict the various head shapes your child might encompass. Browse our multitude of color patterns for your child's STARband helmet! 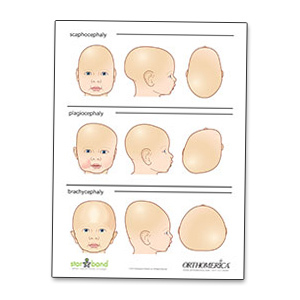 For the Treatment of Deformational Plagiocephaly & Other Head Shape Deformities. Orthotic Management of Pediatric Cranial Deformities using STAR Cranial Remolding Orthoses.